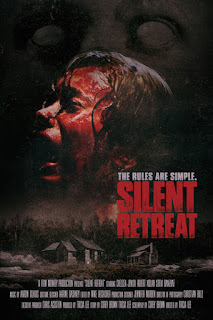 The feature directorial debut for Tricia Lee follows a long chain of horror movies set at rehabilitation retreats (everything from BAD DREAMS through to TICKS and THE MASTER CLEANSE) but finds some beguiling new riffs. Troubled young Chelsea Jenish is banished to a strictly regimented woodland rehab centre that strips its residents of communication, technology and identity in a bid to clear minds. Overseen by misogynistic manager Robert Nolan and his two thuggish sons, the retreat is also host to “something evolution forgot”. The first half is a tad ponderous and the character backstories a little soapy, but this well-crafted, good-looking Canadian production unravels in an increasingly gruesome and darkly witty fashion as the truth about the family-run rehab business becomes clear. Nolan is a marvellously smarmy and articulate villain (“animals can be trained…women are trickier…”), the outbreaks of gore are well handled, and the young leading ladies commit themselves admirably.